The tiny chick was only a day old when he was plucked from the hatchery at a poultry farm and thrown into a massive pile of male chicks. Farm workers gassed the male chicks with carbon monoxide until they were presumed dead. To make a little extra money, they froze some of the dead chicks, planning to sell them as snake food. Shortly after, a snake owner bought two frozen chicks for 70 cents to feed to his snake. But when he got home, he made a horrifying discovery - the two chicks had started to chirp, and then to move. The snake owner was so shocked, he couldn't bring himself to feed the chicks to the snake. 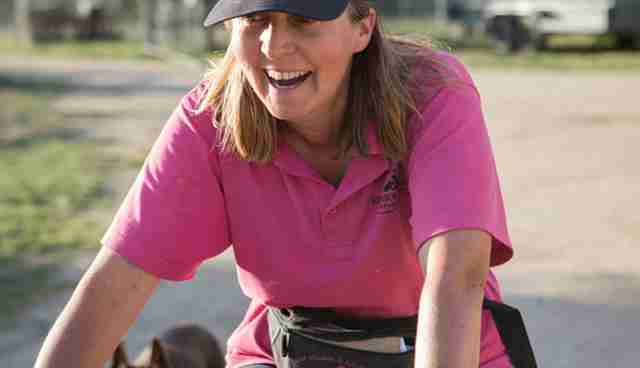 He sought advice, and his friend got in touch with Edgar's Mission, an animal sanctuary in Victoria, Australia. 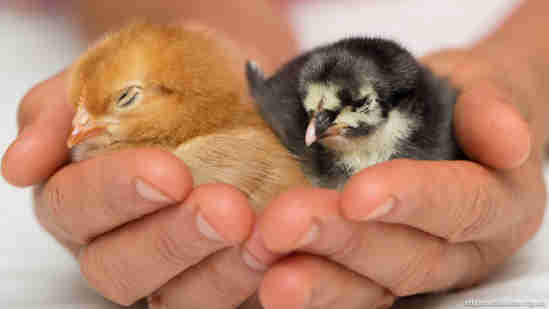 The two chicks - both only two days old - were surrendered into its care. Sadly, one of the chicks died shortly after arriving at the sanctuary. 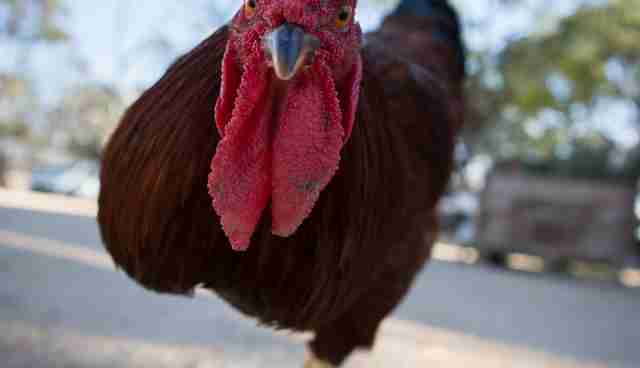 But the other chick - named Red Baron by sanctuary workers - miraculously survived. 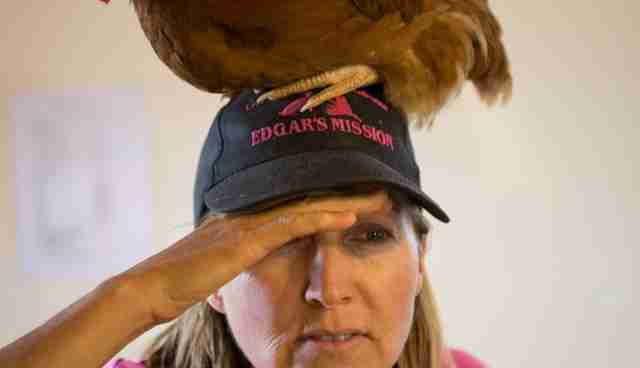 Pam Ahern, founder of Edgar's Mission, knew Red Baron would need extra love after his friend passed away. So she lifted him up, and placed the fluffy baby on her shoulder. "He would desperately chirp when put back in his little carrier," Ahern tells The Dodo, "so I would pop him on my shoulder. He would snuggle in under my hair, much like he would have done had he been raised by his mother hen. Red loves the security and warmth of another, much like we humans do." Soon Ahern's shoulders - or head - were the only places Red Baron wanted to be. He stayed with her when she worked on the computer and went on road trips, and supervised Ahern while she brushed her teeth. 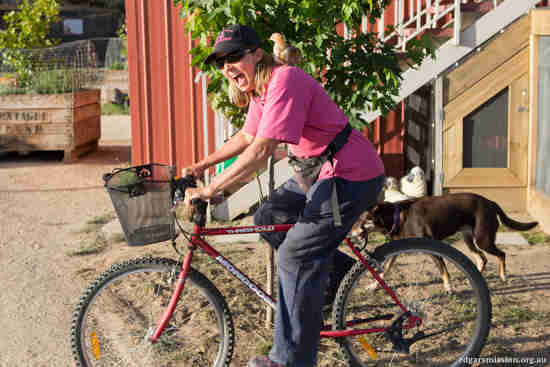 When Ahern went to ride her bike, she wasn't sure if Red Baron would stick around. But this feisty bird didn't miss a beat and taught himself to cycle with Ahern. "I think he worried more about not having me with him," Ahern says. "At first he would stand up, but he quickly learned to sit down and would even close his eyes. Not like one does with a scary driver, but through comfort. He looks very Zen-like sitting up there!" Red Baron has also just learned to crow. "He is so proud of himself when he does it," says Ahern. 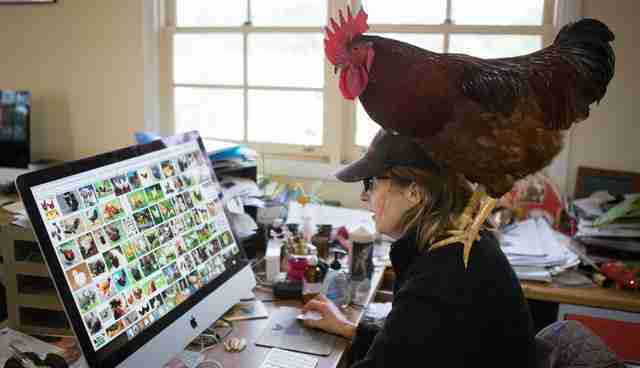 Red Baron had an unusually lucky escape from the poultry farm where he hatched, but most male chicks don't live to tell such incredible tales. Since males don't lay eggs, they have little value in the egg industry, and they're commonly gassed to death with carbon monoxide. It appears that Red Baron also likes to drive the car! 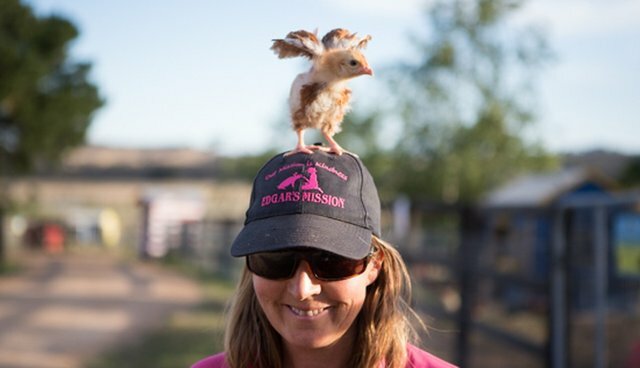 To help roosters like Red Baron, you can donate to Edgar's Mission by clicking here. If you'd like to learn more about the cruel practices in poultry factory farming, check out information from RSPCA or Mercy for Animals' hatchery investigation.